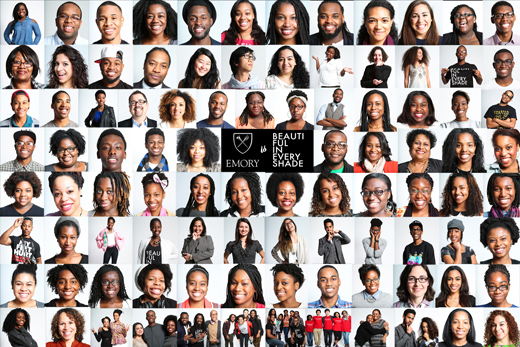 Last year, Mackey, director of Emory's Ethics and Arts program, released "50 Shades of Black," a multi-media art project, funded in part by a grant from Emory's Center for Creativity & Arts, that explores the intersection of skin tone and sexuality in the shaping of identity through images and personal narrative. Through a book of photographs and stories and a related website, Mackey began to foster dialogue among readers interested in ancestry, heritage and identity. In February, Mackey invited faculty, staff and students to attend an open photo shoot at Emory — his first held at a college. Those images have since been turned into a "Beautiful In Every Shade" poster that will soon appear around campus. Since then, public intrigue with the campaign has expanded in unexpected and interesting new directions, according to Mackey. It's clear, he adds, that the project has struck a deep, responsive chord, revealing a broader desire to keep a cultural conversation going. "50 Shades of Black" Facebook page currently boasts nearly 7,000 "likes." "Black Star," a print and digital magazine produced by and for Emory's black students, has partnered with "50 Shades of Black" to produce a special issue this month that features photographs and profiles inspired by Mackey's original book. Inquiries have been received from students in Georgia, Colorado and Michigan about how to schedule open shoots on their own campuses. An invitation to lead a King Day Conversation at Maynard H. Jackson High School in Atlanta. A scheduled open photo shoot in June in Florida for people who identify as "Afro-Native," with African American and Native American ancestry. An invitation to hold an open photo shoot at the Decatur Book Festival for the second year in a row. Inquiries have been received from organizations in Senegal and South Africa about how to adapt the "Beautiful in Every Shade" concept to local community issues. Mackey has been interviewed about the BIES campaign by WonderRoot, an Atlanta-based non-profit arts and service organization that strives to unite artists and community to inspire social change and invited to participate in an ethics conversation around "Passing and the Complex Landscape of Identity Formation" with the cast and director of "By The Way, Meet Vera Stark." In March, Mackey was invited by Emory graduate Christopher Rhodes, Jr., a Wilcox Fellow at Concord Academy, to discuss his project at the college preparatory school located in Concord, Massachusetts — among a handful of inquiries that have arrived from around the country in the past six months. "It (Concord Academy) was a wonderful opportunity to speak about difference and about culture and identity and art in a community that didn't necessarily represent the images that were on my slides," Mackey says. "Whenever I have those opportunities, it helps me to understand the role, the function and the value of cultural competencies … how beneficial it can be to change expectations and the meaningful conversations that can result," he says. "I really see that happening over and over again." Following the presentation, Mackey was approached by many biracial students, who expressed "this overwhelming sense of 'Somebody gets this,'" he says. "What they said over and over was how challenged they felt to be and to perform and to represent blackness — or any narrow definition of what people expected their performance to be," he says. "They felt quite liberated to be freed from that and to know there were other people grappling with that complexity alongside them." But Mackey also heard from Caucasian students "not wanting to be ignorant, yet not knowing how to broach the topic," he says. "They really felt like they had an opening, a resource, a community of people through this platform to ask questions and explore," he adds. "Beautiful In Every Shade" is among a number of racial identity and awareness campaigns that have been emerging on U.S. college and university campuses in recent months, including #itooamharvard, which portrays photos of students holding dry-erase boards that address racially insensitive remarks made by peers, such as "No, I will not teach you how to twerk…" and "You're lucky to be black because it's so easy to get into college…"
"What other campaigns do is relevant, they just take a different approach," Mackey says. "I don't want to shut down the conversation — our campaign is about affirmation." For now, Mackey is open to where those conversations may lead. In Senegal, a grassroots organization is interested in creating a "Beautiful in Every Shade"-style poster to support an anti-skin-bleaching campaign. In South Africa, interest is "much more about bringing a sense of pride and unity among a culturally fragmented society," Mackey says. "There's a level of ethnic diversity we can't appreciate here — they like the message of bridging those divides in their community." "We've come a long way," he acknowledges, "we're working on a couple of proposals, applying for grants that could take this work to a wider audience, bring what started as a grassroots project to full fruition, because I don't think it's reached where it might go. But I think all the makings are there for it to happen."